Established in 1951 by the Brenner family in Winston-Salem, North Carolina, Amarr has grown to more than 1,000 team members, operating two manufacturing plants in the United States, and 75 door distribution centers in the United States, Mexico, and Canada. A family-owned company, Amarr is a leading designer, manufacturer and distributor of garage door systems for residential homes, condominiums, warehouses, commercial buildings, shopping malls and other commercial applications. We carry the Amarr Classica line — Amarr's most distinct garage door. It's made right here in the USA using environmentally-responsible design practices. From a homeowners perspective . Artisan Door Works is singularly focused on creating fine quality garage doors. We like Artisan because of their attention to detail and use of top-shelf material. Their designs capture the rich architectural styles of the homes they are installed in. Recently, Artisan has been able to take the craftsmanship that they put into their custom doors and marry it with processes and materials that create quality doors that are more accessible to a wider audience. If you've heard of only one garage door brand, it's likely Clopay. Year after year, they are North America's leading residential garage door manufacturer. In fact, they are the only residential garage door brand backed by the Good Housekeeping Seal. Headquartered in Ohio, Clopay has been manufacturing beautiful, durable, reliable garage doors for over 50 years. Professional Remodeler: "101 Hottest Products of 2013"
This Old House: "Top 100 Products"
Green Builder: "2012 Hot Products"
If you get a chance, I'd recommend visiting the Clopay blog. They have a lot of interesting ideas and tips for homeowners, and it's not just garage related. For example, this post on outdoor game-day screens just adds another item to my backyard wish list. But we're not the only ones who think the Clopay blog is worth a read. Houzz nominated it as one of the best home blogs in 2015. At the 2016 International Builder's Show, Clopay introduced some exciting new door lines that we're evaluating, like the Canyon Ridge Collection Limited Edition Series faux wood carriage house garage door (picture below). See more from Clopay's 2016 International Builder Show reveal. 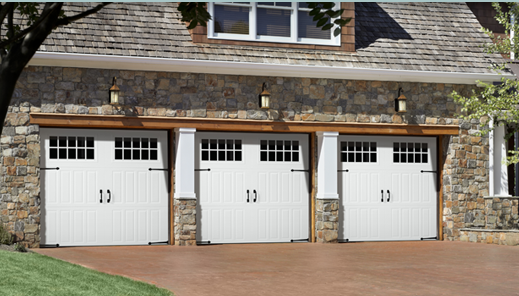 General Doors Corporation is the longest-running garage door manufacturer that we install. They have a combination of quality and selection that we really like. 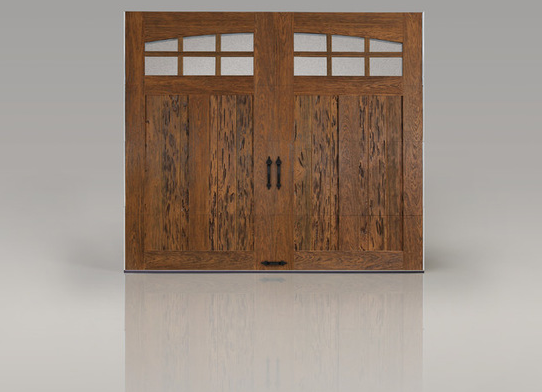 In fact, they are one of the few door companies that still makes a full line of wood doors and that still manufactures their own garage door track and hardware..
General Doors' main office and manufacturing plant is located in Bristol, Pa., approximately 20 miles north of Philadelphia. Richards-Wilcox is a quality garage door manufacturer based in Canada. At over 90 years old, they are one of the world's oldest sectional door manufacturers. Coming from the North, Richards-Wilcox doors are known for their insulation value and durability. We like Richards-Wilcox doors because they are an innovative manufacturere who strives to create eco-friendly and family friendly products that pay close attention to safety features. Generations - the aesthetic of wood without the cost or hassle of maintaining it.